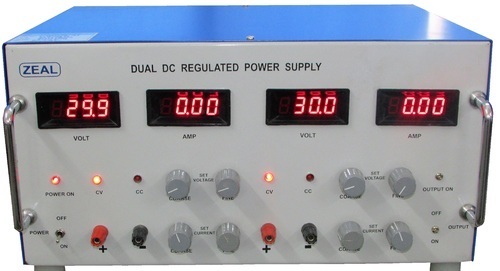 Leading Exporter of dual dc regulated power supply and dc regulated power supply from Pune. 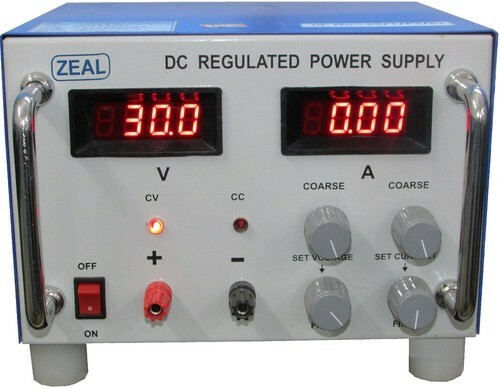 ZEAL make Dual DC regulated power supply is widely used in various industries, laboratories, research & educational institutes. It is cost-effective, highly reliable in performance for long life. AC mains voltage is rectified, filtered and regulated by power transistors. Our designs are linear and hence our power supplies don’t cause electromagnetic noise. Apart from an excellent load and line regulation, they are provided with overload and short circuit protections. Power supply can be used in both CV and CC modes. Protection Overload & Short circuit. Operating Temperature 0 to 50 degree Celsius. We are one of the noticeable providers of a quality grade array of DC Regulated Power Supply for our valued clients. The function of a linear voltage regulator is to convert a varying DC voltage to a constant, often specific, lower DC voltage. In addition, these often provide a current limiting function to protect the power supply and load from over current. Moreover, a constant output voltage is required in many power supply applications, but the voltage provided by many energy sources will vary with changes in load impedance. Looking for “DC Regulated Power Supply”?